A popular filter in the chartmill screener is the squeeze play filter. In this article we will explain the exact conditions for these filters and explain the squeeze play concept in detail. Trading in a narrow range. The goal of the squeeze play filters is to find stocks that are trading in a narrow range. The narrow range indicates that the stock is forming some kind of consolidation or base. As long as the stock keeps on trading in this range it is not that interesting. Only when the stock breaks out of this zone there is a potential for an explosive move. A popular misunderstanding is a confusion with short squeeze setups, remember for once and for all: there is no relation between squeeze plays and short squeeze plays! Bollinger Bands are bands around a moving average, the distance from the moving average is based on the standard deviation. The standard deviation changes as volatility increases and decreases. So the narrower the bands, the lower the volatility. Keltner Channels are placed around an exponential moving average. Instead of using the standard deviation, they use the Average True Range (ATR) as distance. Typically, the standard deviation will be more sensitive to volatility than the ATR. Looking back at our condition we are looking for stocks where the standard deviation is less than 1.5 times the ATR. Typically, stocks are moving in bursts: you have consolidation zones followed by an explosive move. The goal of the squeeze play filter is to find these consolidation zones and to step in before or at the next explosive move. 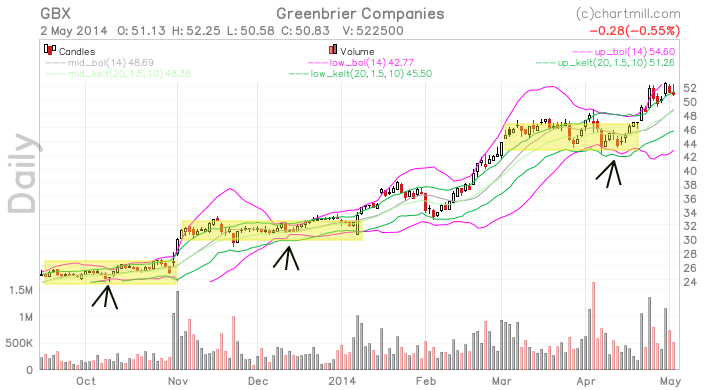 Looking at the chart above, we see a random stock that moved from around 24 to 52. You can see the different consolidation zones and the arrows indicate when the stock was marked as a squeeze play. Squeeze plays explained by John Carter. Squeeze Play Daily Setup: This checks for the squeeze play condition on a daily basis. The Bollinger bands will be inside the Keltner channels. Squeeze Play Daily Short: This checks for a short signal of the Momentum Oscillator after a daily squeeze play setup. So in this case the Bollinger Bands already moved out of the Keltner channels. Squeeze Play Daily Long: This checks for a long signal of the Momentum Oscillator after a daily squeeze play setup. So in this case the Bollinger Bands already moved out of the Keltner channels. Squeeze Play Weekly Setup: This checks for the squeeze play condition on a daily basis. The Bollinger bands will be inside the Keltner channels. Squeeze Play Weekly Short: This checks for a short signal of the Momentum Oscillator after a weekly squeeze play setup. So in this case the Bollinger Bands already moved out of the Keltner channels. Squeeze Play Weekly Long: This checks for a long signal of the Momentum Oscillator after a weekly squeeze play setup. So in this case the Bollinger Bands already moved out of the Keltner channels. Interesting Combinations with other filters. Momentum squeeze play setups: This uses the trend intensity indicator to find squeeze plays in strongly trending stocks. Short squeeze play setups: This screen also uses the trend intensity indicator to find squeeze plays in stocks in a downtrend. We are looking for short opportunities here. Strong stocks/High relative strength stocks: find squeeze plays in strong stocks. Pocket pivots: show squeeze plays with some pocket pivots in the forming base. Effective Volume: find squeeze plays where large players are accumulating while the base is forming.